I discovered there is something that is very close to the magic wand from Star Trek! It is a cold laser unit. Yes, laser like they shoot into space, or use to cut things . . . except it is cold, and it will not burn. When I heard about it, I knew you would want our animals to have it. 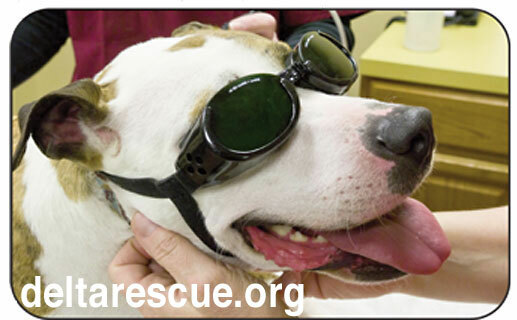 This little girl is wearing “Doggles” while undergoing laser therapy for a painful spinal issue. 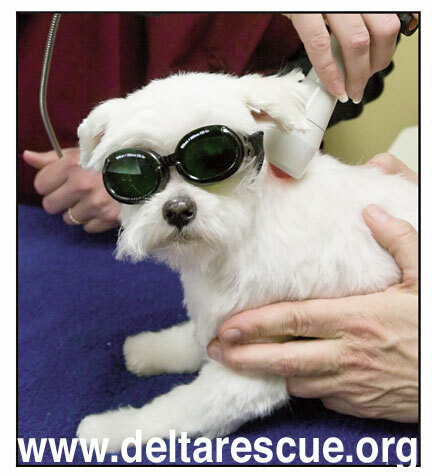 The “Doggles,” doggie goggles, are to protect their eyes from the laser which will permanently blind anyone looking directly at it. Our staff wears the goggles as well. The nurse holds a little hood over the cat’s face so she is protected. We have a unique situation here at DELTA Rescue. . . the only one in the world like it. Our animals are with us from rescue til death. Our medical records are complete with EKG, ultrasound, X-rays, blood tests, etc. Some day our records will be entered into a super computer in some university and new medical discoveries will be made based on our work in this lifetime. I am hoping that our laser will get in there and stimulate the body’s cells to fire up its natural healing process. The unit we need is seen here. The unit is light and portable and can be carried in a sling, and I can’t wait for us to use it on our horses! Because each of our horses suffered some sort of abuse before being abandoned, back and leg issues are common in our herd. 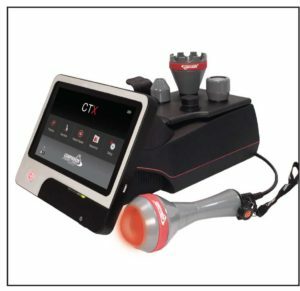 We are hopeful that the laser will jump start our horses’ bodies into healing these chronic conditions. We need at least two of these units at a cost of $60,000. One unit is for surgery where all animals with incisions will be treated for post op pain and more rapid healing. The second unit is for our animals with chronic conditions who will be treated three times a week. Please help me continue this mission, send your best gift to our animals today. Get this entire story and others by signing up for our monthly newsletter. Sign up and get interesting news and updates about DELTA Rescue residents, delivered to your inbox. ‹ Like a parent, it is my job to be sure each of our animals never has to worry again.